Many teens who use abuse prescription drugs are not trying to get high, but are using them to help them deal with an underlying problem such as anxiety, a newly published survey suggests. The survey included responses from more than 1,000 13- to 18-year-olds from around the country who were recruited in shopping malls. They completed a web-based questionnaire on their use of substances including alcohol, tobacco, and both legal and illegal drugs. They were also asked whether they struggled with anxiety, felt a desire to be popular, sought out exciting activities, and what level of risk they associated with prescription drugs. The researchers found one factor that affected teens’ use of prescription drugs was the need to feel popular. “Wanting to fit in with your peers is connected to anxiety,” Delaney said. The use of other restricted substances, such as alcohol, also increased the risk of prescription drug abuse. “Adults spotting teens with very high levels of anxiety and at least moderate use of other restricted substances should realize that these are students with a high likelihood of prescription drug abuse,” the authors wrote in the Journal of Public Policy & Marketing. The researchers found 20 percent of teens reported they had a friend that abused prescription drugs. They identified prescription drugs as a new tier of drug abuse after the traditional “starter drugs” such as beer/wine, cigarettes, liquor, and marijuana. Teens said they got prescription drugs primarily through friends, who in turn got them from their home medicine cabinets. “Parents need to safeguard medicines in their home, and get rid of medicines that are out of date,” Delaney said. The researchers noted that because parents may not be aware of the level of risk or that their teenagers may be abusing prescription drugs, they may leave prescription drugs in open medicine cabinets, offering easy access. The survey found teens felt that prescription drugs were less risky to use than street drugs. 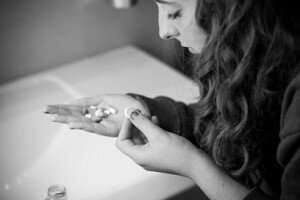 “Previous research has found a teen’s decision about whether to try a drug is strongly associated with their perception of the drug’s risk,” she noted. “They think, ‘How risky can it be if these drugs are prescribed by doctors?’” Public education campaigns need to better communicate the risks associated with prescription drug abuse, the researchers conclude. The study’s co-authors were Richard Netemeyer of the University of Virginia, Scot Burton of the University of Arkansas and Gina Hijjawi of American Institutes for Research. This is a complex problem without a simple solution. The reasons teens use and abuse substances are as vast and different as their personalities. Understanding risk factors and root causes is important but so is being an engaged and active parent during the teen years! Not easy but critical to keeping them safe. Alcohol and drug use is harmful to all teens – their brain is dramatically impacted as well as their future. The earlier they engage the greater their chance of an abuse problem as an adult. There are a lot of resources for parents but you have to be willing to lean in during the high school years not let go. Which they desperately think they want you to do. Parenting teens is not easy. Adolescents that abuse drugs to feel different are doing that due to unmet mental health disorder treatment? To what extent is this article offering this old conclusion as science because the research was funded by the former Abbott Labs, and because of the business backgrounds of the authors? In the full article, the increase in adolescent PDA is properly attributed to environmental factors related to the increased access (and direct marketing on widely accessible media) to pharmaceuticals before it is concluded that adolescents who ingest things to feel different than normal is a poorly managed pursuit to treat mental health disorders. At what point did the wild mood variations, and anxiety related to transitioning to an adult, become a mental health problem? Isn’t that being an adolescent? Adults shouldn’t pathologize adolescent angst and be more attuned to the likelihood that a child needs medication, they should provide support for adolescents to develop coping skills, relationship skills and resiliency. At the same time, adolescents will try different ways to feel different than normal and some are a very bad idea—so bad, in fact, that regular use of mood altering substances can become a source for mental health disorders. Better living through new behaviors, understanding of life and new skills is a better plan than better living through properly prescribed chemicals. The correlation of the risk for future mental health disorders with the increased risk for future substance use disorders is likely to be driven by common root causes more than “untreated mental health disorders” evidenced by substance abuse. A different interpretation, funded by a drug manufacturer, should not surprise, nor confuse, folks with addiction knowledge.